In November we provide you with a stage, an audience, five judges, The Score Adder, two microphones, and two minutes on stage, for prizes, FIRST PRIZES from Impact Comics, The Games Capital, Smiths Alternative Bookshop, and from underneath the back office desk. And of course we provide you with the Master of Conflict to arbitrarily judge the poet amongst poets to claim one of our many many first prizes and quite likely the best of the first prizes. So we want your words on stage to perform poems, be scored, be judged, care or not care about the judges, and drink some cider and or whiskey and or something else. One feature is Emilie Zoey Baker. Poet and spoken word performer Emilie Zoey Baker is the winner of the 2010 International Slam Review as part of the Berlin International Literature Festival, she also toured and performed in Paris, London and Singapore ending at the 2010 Ubud Writers festival in Bali. She toured North America in 2009 following an invitation to perform at Montréal’s Festival Voix d’Amériques. The tour included New York, Chicago, Toronto, Ottawa and Vancouver. And returning to BAD!SLAM!NO!BISCUIT! 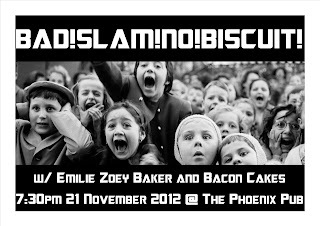 as the BAD!SLAM!NO!BISCUIT! house band is Bacon Cakes. 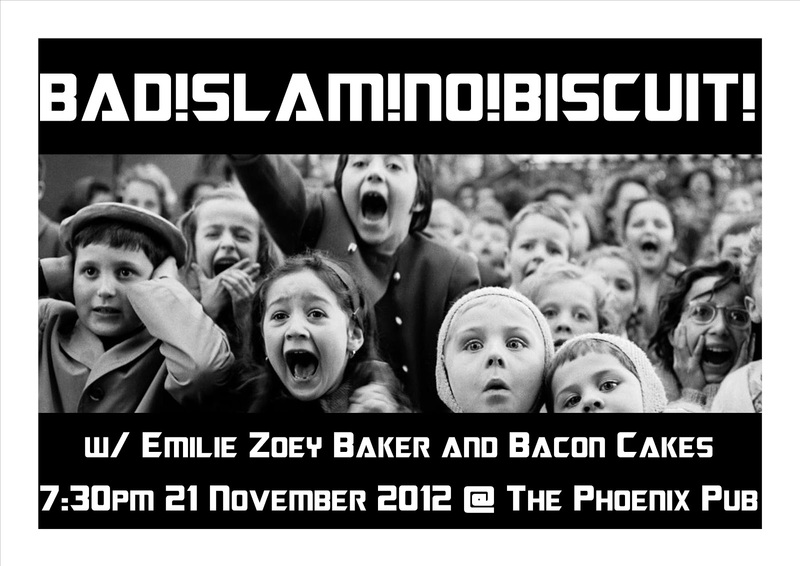 So join the BAD!SLAM!NO!BISCUIT! at The Phoenix Pub for poetry, and remember, no props, no music, YOUR ORIGINAL WORDS, on stage, signup at 730pm, for prizes, for glory, for a peg leg.